Did Clayton Christensen predict Twitter in 2004? Professor Clayton Christensen has written some very interesting books outlining his theories governing disruption in industry, where new entrants to a market using seemingly inferior technology carve out a niche the existing incumbents are not interested in. From this niche they then gain prominence to the point where it is too late for the incumbent players to respond. These are the reasons DEC and SGI no longer provide computing equipment to anyone. The workstation class PC killed them. 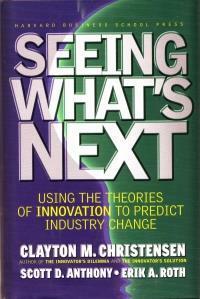 One of Clayton Christensen’s books is Seeing What’s Next, published in 2004. The final chapter of the book “Breaking the Wire” is about the possible future of the telecoms industry. The last section of this chapter, section 4, “Competitors from strange places” outlines possible threats to incumbents from Instant Messaging and from Microsoft’s Session Initiation Protocol (SIP). Hindsight shows us that Microsoft didn’t use SIP to enter the telephony market. The interesting text are the comments about Instant Messaging – how the ability to do instant messaging provides an adequate service even at low quality. The hallmarks of a potential disruptive idea. “IM’s growth and improvement is worth watching because companies that play in the IM market could develop business models that just don’t make sense to telecommunications companies”. I couldn’t help thinking of Twitter as I read these few paragraphs. SMS text messaging is not instant messaging, but for me the parallels are there. Its restrictive and inadequate (140 characters! ), but it does the job. A few years later Twitter was born. OK, I have the benefit of hindsight as I read this book. But those words I quote were written in 2004, maybe 2003. If you want to read some interesting books about business, backed with lots of case studies, I recommend Innovator’s Dilemma and all the books that flow from it by the same author. If you are a software developer or run a software based business, you can hear Professor Clayton Christensen speak at the Business of Software conference in Boston this October.